Single Client Access Name (SCAN) is a feature used in Oracle RAC environments that provides a single name for clients to access any Oracle Database running in a cluster.The main benefit is that the client’s connect information does not need to change if you add or remove nodes or databases in the cluster. Now in the following post we’ll understand how this SCAN concept manages the connections internally, for that we first need to understand the set-up of SCAN. For this you need to have a DNS entry with one single name that resolves to 3 IP addresses using a round robin algorithm. The IP addresses must be on the same subnet as your default public network in the cluster (In 12c R1 SCAN would support multiple subnets). In this case Oracle assumes you use some form of dynamic IP assignment on your public network, so you just need to mention the SCAN name and 3 IPs will be acquired from either a DHCP service or SLAAC when using IPv6 based IP address. Round-robin on DNS level allows for a connection request load balancing across SCAN listeners floating in the cluster. If your DNS is set up to provide round-robin access to the IPs resolved by the SCAN entry, then run the “nslookup” command at least twice to see the round-robin algorithm work. The result should be that each time, the “nslookup” would return a set of three IPs in a different order. Three IP addresses are recommended considering load balancing and high availability requirements regardless of the number of servers in the cluster. The CRSd process starts orarootagent & oraagent processes, orarootagent is responsible for starting Node VIP, SCAN VIP and oraagent process is responsible for starting SCAN Listener and Node Listener. For each of the 3 IP addresses that the SCAN resolves to, a SCAN VIP resource is created and a SCAN Listener is created. 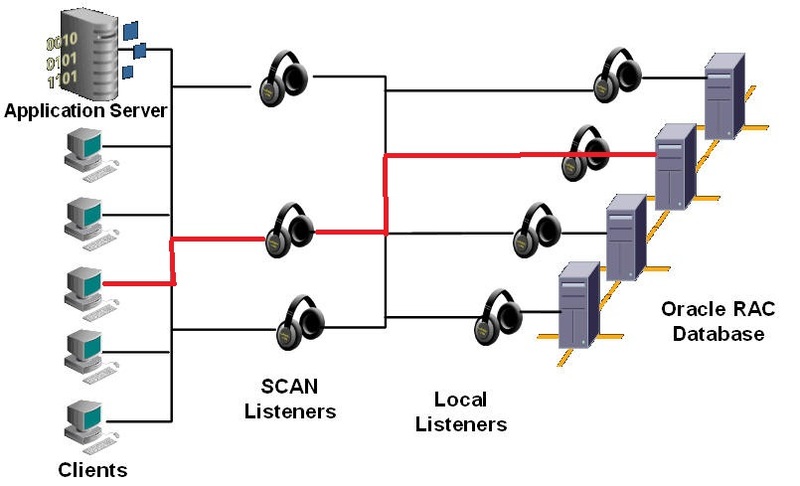 The SCAN Listener is dependent on the SCAN VIP and the 3 SCAN VIPs (along with their associated listeners) will be dispersed across the cluster.REMOTE_LISTENER parameter is set to the SCAN by default this allows the instances to register with the SCAN Listeners as remote listeners to provide information on what services are being provided by the instance, the current load and a recommendation on how many incoming connections should be directed to the instance. The LOCAL_LISTENER parameter is set to the node-VIP, the node listener run out of the Oracle Grid Infrastructure home and listens on the node-VIP using the specified port (default port is 1521). So up till now we understood, SCAN configuration, SCAN IPs, SCAN Listener & Node Listener and how the Instances provide relevant information to SCAN Listeners, now we’ll understand the Client Side Load balancing in RAC using SCAN which would further explain another major benefit of using SCAN. Client Side Load Balancing – For clients connecting using Oracle SQL*Net 11g Release 2 and above, 3 IP addresses will be received by the client by resolving the SCAN name through DNS. The client will then go through the list it receives from the DNS and try connecting through one of the IPs received. If the client receives an error, it will try the other addresses before returning an error to the user or application. This is similar to how client connection failover works in previous releases when an address list is provided in the client connection string. 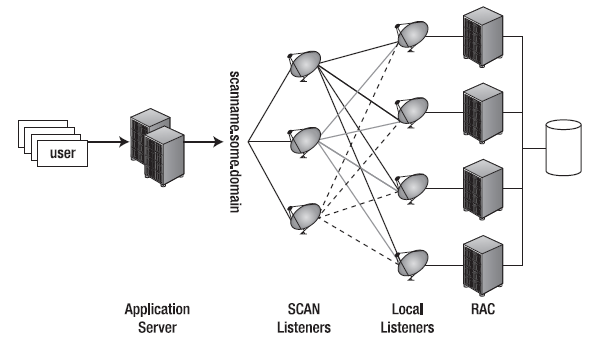 Server Side Load Balancing – When a SCAN Listener receives a connection request, the SCAN Listener will check for the least loaded instance providing the requested service. It will then re-direct the connection request to the local listener on the node where the least loaded instance is running. Subsequently, the client will be given the address of the local listener. The local listener will finally create the connection to the database instance. I hope the above information helps you in understanding the SCAN Concept, how it is configured and how it is used for client/server side connect time load balancing. Please comment below if you need more information on SCAN & Load balancing as in how to configure client/server side connect time load balancing, Transparent Application Failover concept, FAN Concept, etc. Thanks Nitish, I just followed your all notes under Oracle RAC. Can you please share some documents on topics “SCAN & Load balancing as in how to configure client/server side connect time load balancing, Transparent Application Failover concept, FAN Concept, etc.” via email (ocp.suman@gmail.com) or links. I really need of those documents to clear concepts which will help to clear one assesement. Thanks for reading the blog, I’ll be sharing the requested post soon (in a couple of days), please subscribe for the alerts so that you can get notification when I post the article with requested information.